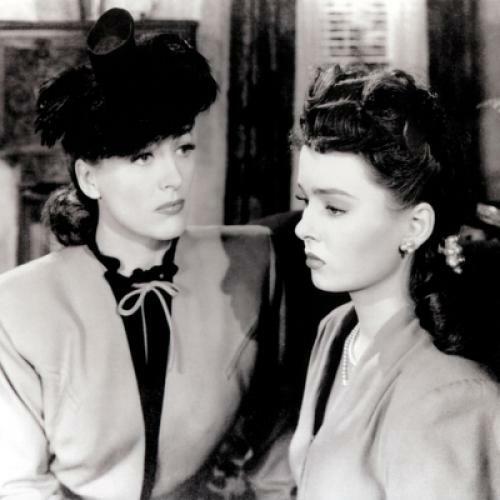 The story of Warner Brothers’ movie, “Mildred Pierce,” recounts the enormous and unrewarded sacrifices that a mother (Joan Crawford) makes for her spoiled, greedy daughter (Ann Blythe). The mother, whose husband (Bruce Bennett) has left her to live with another woman, starts baking cakes and pies for the neighbors, becomes a waitress in a tearoom, opens a drive-in-restaurant, marries a society gigolo for his name, and finally tries to get her business partner (Jack Carson) convicted for the murder committed by her daughter. It ends with the girl being led away to prison and the mother beginning a new, more beautiful existence with her first husband, who has just got work in an airplane factory and whose mistress has married someone else. So far as the conflict between mother and daughter is concerned, Joan Crawford usually makes the mother’s actions credible and forceful, but the relationship between her and her daughter is generally on a trite plane, and it is too sketchy to make all the melodramatic sacrifice seem anything but silly. The origins and the real life of such a situation are practically left out, so that the only question the movie gives you a reason for asking is. Why is the mother such a fool? The daughter—due to Miss Blythe’s immobility of face, the fact that she seems always about eighty years too young for what she is doing and that the director trusts her with as little to do as he would an untalented mouse—doesn’t seem to be a human or logical part of the picture. Once or twice the mother and daughter are thrown together with some of the impact there ought to be all the way through, and at somewhat greater length than it takes to say “I bought you a car” and “Oh, Mother!” One of these scenes takes place during a good quarrel on a staircase, in which there are some brutal, majestic images by Miss Crawford of hatred, horror and especially a caved-in look of defeat. The direction and writing, though, in “Mildred Pierce” are less interested in this relationship than they are in showing how lascivious, zealous to make money, untrustworthy, loveless and discontented its Americans are. There is hardly a moment when money is not being haggled over, borrowed, used as a club, waved like a flag, made the reason for marriage, stolen, slaved for or got through blackmail. The movie is full of expressions like “stinker,” goes any lengths to show a man grabbing at a dress or ogling a woman’s legs, and the most elevated person is considered to be Mildred, whose ignoble actions number only about a dozen. The lack of love, comfort or hope in her marriage is believably done; so is her working, which is hurried, hectic, unquestioning, and something that dominates her entire self; and in its best moments, like that near closing time at the restaurant, people seem dissatisfied, lost, degenerate, frustrated and tense. More often than not, though, the decadence and cynicism are mechanical and stereotyped, and except for Miss Crawford and Mr. Bennett, the acting as well as the characterization is lifeless and unsubtle. So that there is the strikingly unpleasant feeling that the producers were unaware of the extreme immorality of the characters, thought much of the action noble or virtuous, and as a result had nothing to offer either in power in the theme or in alternatives. The production, mainly because of Michael Curtiz’s direction, is unimaginative and badly hoked-up. The most pedestrian note is the way people are arranged for each scene as though at a first rehearsal, all squared off facing the audience. The main variations on this statically balanced arrangement are to show it behind a window or a screen or to have a mirror and its image somewhere in the shot. Most of the actors are the victims of atrocious casting. The only important, pleasant fact in the production is Miss Crawford’s performance, which is so honest and good that she looks like everything she is supposed to look like: she is tremendously resolute and forceful, strongly set in the middle class, cold, hard and driven, and has, in addition to the fanaticism of her devotion to her daughter, a soft, lyrical love. Director Curtiz can produce scenes as phony as the one in the police room, in which an attempt to dramatize ordinary noises makes the unfolding of a newspaper sound like a decrepit garage door being opened; and shots as vulgar as the one of a seduction, which moves from an embrace to a mirrored wall, where there is the embrace again. No one else today, save possibly Victor Fleming, could direct a scene to rival dime-store art like the one at the end of this movie, in which Mildred leaves the police station, passes some charwomen arranged as though in a Millet painting, joins with her first husband in a movement suitable to a coronation, and then walks with him toward the outside world, which is composed and painted with dazzling cheapness. This article originally ran in the October 22, 1945, issue of the magazine.